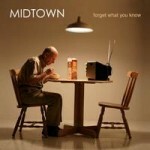 Roll up, roll up, experience the Mighty Midtown�s third album, recorded without the aid of a record company safety net! For their new long player the New Jersey quartet enlisted the production prowess of Butch Walker and came up with the first album they�re 100% happy with. Marking a departure from their signature upbeat pop-punkiness, �Forget What You Know� inhabits a darker place altogether, and titles like God Is Dead and The Tragedy Of The Human Condition suggest they�ve either had their heads firmly buried in weighty philosophical tomes, or up their own arses. I�m feeling charitable, so I�ll go with the former. Opener To Our Saviour hurtles at you like a squad of trigger-happy commandos, guitars blazing, machine-gun drum volleys and Gabe Saporta screaming �so hard to believe what you're looking for�. Wow, OK, so you�ve got my attention, what are you gonna do next? Give It Up is a Jimmy Eat World thoughtful rocker bristling with choppy guitars and nifty bass work, suddenly going all a cappella, the vocal harmonies as multi-layered as an X Files story arc, before the belting heartfelt finale. Other highlights include the frantic emo-punk raunch of Help Me Sleep (ending with a barnstorming heavy blues guitar workout), the shimmering jangly pop of Until It Kills, and Whole New World, a superb melodic rocker that knocks spots off Incubus, with themes of desolation and isolation that run throughout the album; �just because we�re abandoned, doesn�t mean we�re alone�. See also Empty Like The Ocean: �I don�t care where you come from, if it�s awful there, all of us are alone� and the Simon & Garfunkel-go-emo Waiting For The News with its melancholic piano and West Coast harmonies: �even though we sleep together we�re alone�. Penultimate track Manhattan is rock tango swathed in a beautiful muted ballad, and the album ends in stompingly fine Motion City Soundtrack-style with So Long As We keep Our Bodies Numb We�re Safe, but my oh my, it really should have been faded out around the 4 minute mark when the Beach Boys vocals chip in, rather than loop it out to an unforgivable 13 minutes just to bump up the running time. Still, this is something of a standard setter and should see Midtown begin the transition from followers to leaders.